“While as an interpreter he is remembered most readily as an advocate of the piano music of Ludwig van Beethoven, Artur Schnabel's own favorite among the so-called ‘Great Masters’ was Franz Schubert. 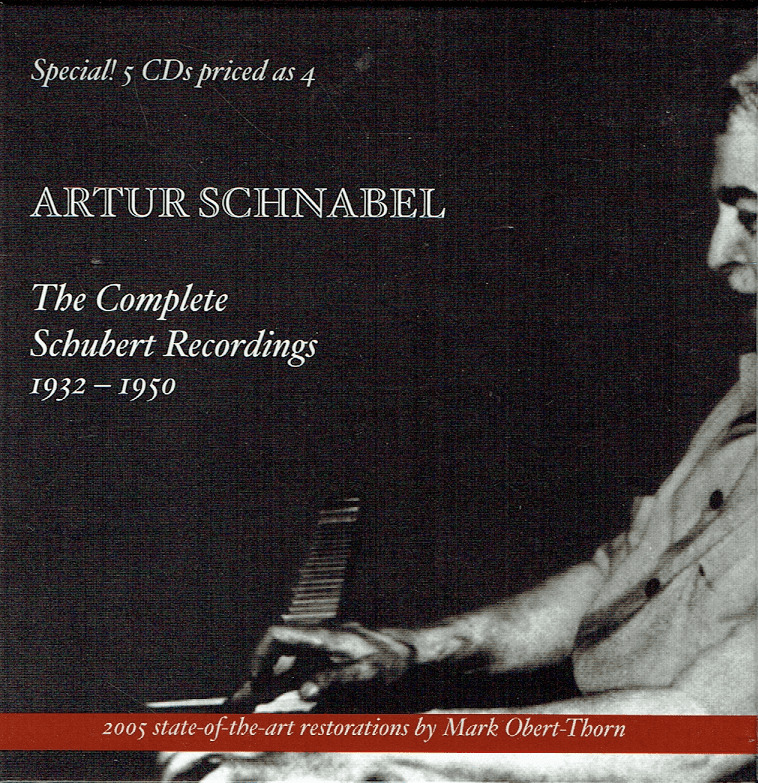 Largely, Schnabel was able to record his little sips of Schubert in between great heaping gulps of Beethoven, and over a period of eighteen years managed to amass the 5 CDs worth of music that makes up Music and Arts' magnificent ARTUR SCHNABEL: THE COMPLETE SCHUBERT RECORDINGS. 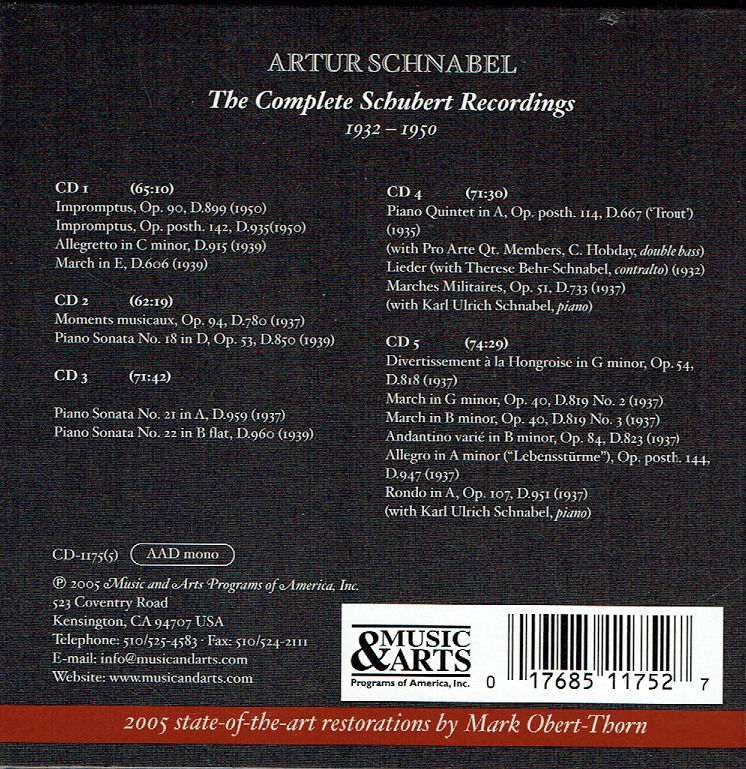 This set is ‘complete’ in the sense that it includes every disc of Schubert that Schnabel made and approved for commercial release. The five disc selection as it stands is extremely generous - both sets of Impromptus, three of the late sonatas, the Moments musicaux and four-hand works played with his son Karl-Ulrich Schnabel, including the Marches militaries. There is a selection of lieder performed with Schnabel's wife Therese Behr-Schnabel, a complete ‘Trout’ Quintet and numerous smaller Schubert keyboard pieces scattered throughout the 5-disc set. 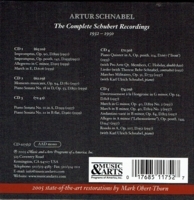 Most Artur Schnabel solo recordings, made at EMI's Abbey Road studios for release on HMV and Victor between 1932 and 1950, have seldom wanted for re-issues. Arabesque put them out on LPs in the late 1970s, and EMI responded with their own Schubert re-issues in the1980s. Tapes created at that time remain the basis of what EMI continues to use in their single-disc Schubert/Schnabel entries, and if all one wants is a taste of this experience, these are still relevant despite their limited high-end response, errant pitch and audible turntable rumble. Comparatively, the Music and Arts issue is not expensive when you consider what you are getting, and the quality of the transfers here, by Mark Obert-Thorn, are state of the art. There is an excellent booklet which includes rare photographs and an appreciation by pianist and critic Harris Goldsmith.